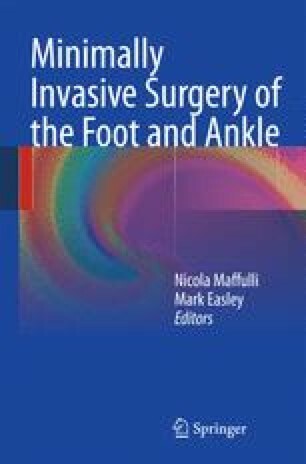 Endoscopic assisted distal soft-tissue correction for hallux valgus deformity follows the same principle of the open procedure.1–3 This approach is indicated with symptomatic hallux valgus with an incongruent metatarsophalangeal joint and no significant bony abnormality (e.g., severe hallux valgus interphalangeus or abnormal distal metatarsal articular angle). It is contraindicated if the intermetatarsal angle cannot be corrected manually (e.g., presence of os intermetatarseum). Sometimes, the correction may be obstructed by the dislocated fibular sesamoid bone in the web space. This is not a contraindication of the procedure, since the sesamoid can be reduced after lateral release and the intermetatarsal space can then be closed up. Osteoarthritis of the first metatarso-phalangeal joint and deformity resulting from neuromuscular conditions are other contraindications.